Professor Pak-Chung Ching is Director of Shun Hing Institute of Advanced Engineering and Choh-Ming Li Professor of Electronic Engineering of The Chinese University of Hong Kong. He received his Bachelor in Engineering (First Class Honours) and PhD degrees from the University of Liverpool, UK, in 1977 and 1981 respectively. 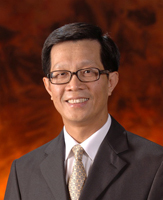 Professor Ching is a Fellow of IEEE, IET, HKIE and HKAES. He is Chairman of the Veterinary Surgeons Board of Hong Kong and Chairman of the Board of Directors of the Nano and Advanced Materials Institute. Professor Ching was awarded the IEEE Third Millennium Award in 2000, the HKIE Hall of Fame in 2010, as well as the Bronze Bauhinia Star and Silver Bauhinia Star by the Government of HKSAR in 2010 and 2017 respectively. His research interests include adaptive digital signal processing, time delay estimation and target localization, blind signal estimation and separation, automatic speech recognition, speaker identification/verification and speech synthesis, and advanced signal processing techniques for wireless communications.